One of the biggest challenges students can undertake is signing up for Organic chemistry in the summer. How so? Well, there are a few reasons. First, the course time usually shrunk from 16 week to 8 weeks. This means, longer classes and more frequent tests. Secondly, the subject material is usually covered more quickly, but the content remains the same. As such, students can feel overwhelmed and become exhausted studying the materials much more quickly than is typical. But, we here at StudyOrgo have streamlined the process of studying organic chemistry mechanisms! Our illustrative overviews with full mechanism descriptions and diagrams makes mastering any reaction in your class much easier. And, with over 170 reactions, you’ll feel confident you’ll have everything you need to get the “A” in this course. Here are a few tips for getting the right start to studying with help from StudyOrgo today! Time management – Schedule your studying NOW! – Time management is the key to acing organic chemistry in the summer. Take a calendar and divide the time you have to each test by the number of chapters. Schedule 2-3 hours a week to study and DON’T SKIP OR RESCHEDULE. Think of it as a doctor appointment – you just have to do it! Also, if you plan your studying ahead, you will be less likely to schedule something that gets in the way because you will already have penciled it in! Use your Smartphone calendar to send you alerts and reminders for your studying appointment. Open your text book – Read the title and abstract on the first page of each chapter and check out the number of pages. It will give you a very quick idea of what you will be learning about in each chapter and how much material you will be covering. Look at a syllabus – Remember, your syllabus is an official contract between you and the professor. They must disclose what you are required to learn and how you will be graded. Professors can remove requirements at will but cannot add them easily. Use this to your advantage! Highlight the contents or reactions of the book that will be required and use this to focus your attention on while studying over the summer course. Read ahead – Before each class, glance at the chapter to be covered that lecture beforehand. Don’t try to understand everything, just pay attention to the major words and phrases used and the ideas. This will allow you to pay more attention during class because you will already know what is being said, now you pay attention to the details. Most people are scrambling to write down notes and drawings in class, but not really paying attention. Try it yourself, look at your classmates at the next class for a minute or two, they are usually feverishly writing! Sign up with StudyOrgo – The Editors at StudyOrgo have painstakingly reviewed and prepared the material in the most crystal-clear and “get-to-the-point” manner as possible. We consult students and ask for their opinion on whether they understand the material as presented. We provide quick descriptions and in-depth mechanism explanations. Many of our reaction have multiple examples, so you can learn and then quiz yourself in our website! For the student on-the-go, we have also developed a mobile app (iOS and Android) provides all the functionality of the website! All of these benefits are included in your StudyOrgo membership! 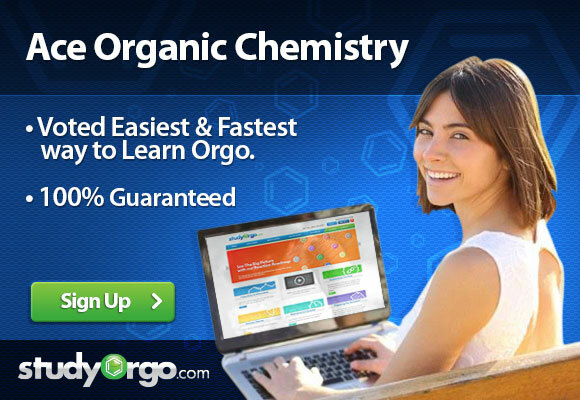 With a little time management and StudyOrgo, you will have no trouble getting an A in Organic Chemistry this summer!